You can't talk about technology implementation without discussing change. Tending to technology needs in today's changing nonproﬁt landscape requires ongoing cultivation and adaptability. We launched the ﬁrst issue of 2014 by planting the seed: How can nonproﬁts remain competitive, innovative, and responsive to the changing external environment? The inspiration, as reﬂected on the covers, came from farmers, a profession characterized by the need to be responsive. We've come full circle. In this issue, the articles reﬂect on 2014, and oﬀer up some important perspectives to take into the New Year. In Tech Forward Leadership, Miriam Barnard explains that 75% of nonproﬁts will undergo an executive transition in the next ﬁve years, and how tech leadership should be a critical attribute when hiring. Security technology expert Jeﬀ Forristal explains the steps that nonproﬁts can take to ensure that sensitive information, like donor data, remains secure across all devices. In Dark Side of the Force, Bonnie McEwan interviews four nonproﬁt pros to ask: When campaigns go viral, how can nonproﬁts prepare for the heightened scrutiny of social media? 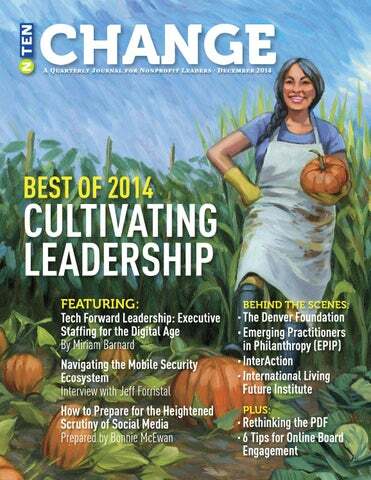 We also go behind the scenes with The Denver Foundation, InterAction, Emerging Practitioners in Philanthropy, and the International Living Future Institute to learn how they’re using technology for social change. Network for Good and Vibrance Global explore diﬀerent donor experiences, Jeanne Allen oﬀers six tips for online board engagement, and James Murdock eloquently shares his experiences on a question we take to heart: How can nonproﬁts rethink the PDF? We hope these articles prepare and inspire you to create change in your organization and through your mission. Roll up your sleeves and dig in. Thanks for reading! Tending to technology needs in today’s changing nonprofit landscape requires ongoing cultivation and adaptability. AT A GLANCE NTEN: CHANGE JOURNAL DECEMBER 2014 Tech Forward Leadership: Executive Staﬃng for the Digital Age – page 6 By Miriam Barnard, Nonprofit Organization Strategist and Consultant, MiriamBarnard.com Research predicts that over the next ﬁve years, up to 75% of nonproﬁt Executive Directors (EDs) will leave their jobs. As the nonproﬁt sector braces itself for a massive leadership transition, how can your organization ensure that your next executive is a tech-forward leader? Learn why tech leadership is a critical attribute for the next generation of nonproﬁt EDs, and how you can make sure your organization is poised for success. page 8 Designing Meaningful Donor Experiences to Interview with Jeff Forristal, Bluebox Inspire Giving – page 16 Early computer security looked a lot like physical security: By Yasmin Nguyen, Vibrance Global put all your valuable assets in one place, and build a Whether we are fundraising or in a sales role, asking for fortress around it for protection. Today, ﬁrewalls and what we desire and need can often trigger fears, centralization are a lost cause; mobile is everywhere so anxieties, and frustrations in many of us. When we shift you must protect data independent of location. Learn the our mindset and perspective from asking to giving, steps that nonproﬁts can take to ensure that sensitive we can instantly change our experience and results. information like donor data remains secure across all Philanthropist and storytelling strategist, Yasmin Nguyen, devices. outlines his approach and strategies to designing meaningful experiences that inspire donors and Generosity, the Subscription Economy, and the customers to give and share our stories. Future of Nonproﬁt Fundraising – page 12 By Jamie McDonald, Network for Good Points of View | The Dark Side of the Force: Recurring giving is revolutionizing the way nonproﬁts How to Prepare for the Heightened Scrutiny of fundraise. No longer do we have to ask the same donor Social Media – page 18 for a gift every year. With the rapid growth of fundraising Prepared by Bonnie McEwan, Milano – The New School technology, nonproﬁts can not only get more dollars in and BonnieMcEwan.com the door, but retain donors at a higher rate—without Given the critical backlash to the recent ALS Ice Bucket having to bug them every December. Network for Good Challenge, we wondered how nonproﬁts handle the gives you the scoop on how to start a recurring giving scrutiny that comes from extensive visibility in social program and why you should right now. media. To ﬁnd out, we talked with four nonproﬁt professionals to get their diverse points of view: Jereme Bivins, The Rockefeller Foundation; Mike Morey, SKD Knickerbocker; Amber Washington, PolicyLink; and Brooke Wiseman, Blessings in a Backpack. Behind the Scenes: The Denver Foundation Grantmaking in the Digital Age – page 22 Interview with Christiano Sosa, Director of Capacity Building, The Denver Foundation Technology is a critical tool to help nonproﬁts gain tremendous eﬃciencies in their work – especially with fundraising applications. At the Denver Foundation, an impressive 76-100% of their grantees have demonstrated exactly that. In this interview, learn how this 90-year-old Foundation tracks their outcomes, measures impact, and strategically uses technology in their everyday work to continually reinvent themselves to be relevant to their community. Behind the Scenes: Emerging Practitioners in Philanthropy (EPIP) Building the Next Generation of Leaders – page 24 Interview with Rahsaan Harris, Executive Director, EPIP What does it take to build the next generation of leaders? In this interview with Rahsaan Harris, we learn his journey to become the head of EPIP, his work on the Member Connect and Measure a Leader (MCMal) campaign to build leadership skills, tips for fundraising, and the importance of leveraging the power of networks. Project Spotlight: Mapping Disasters and Development – page 27 By Julie F. Montgomery and Laia Griñó, InterAction Information “is as important as water, food, or shelter,” in a humanitarian crisis, or long-term development for that matter. Drawing on the lessons learned from the international community’s response to the earthquake in Haiti, an alliance of U.S. NGOs is now using new online mapping and data visualization technologies to help NGOs better share information, avoid duplication of eﬀorts, and make smarter decisions through data analysis. Rethinking the PDF: Designing Publications for a Mobile World – page 30 By James Murdock, Carnegie Corporation of New York As more people use smartphones and tablets to access donor magazines, annual reports, and other web content published by nonproﬁts, readers are seeking a better reading experience than the PDF format can provide. Several tools and approaches, designed for every budget, allow organizations to enrich their digital publications with multimedia, social sharing, and other features that make the reading experience more engaging and better suited to the mobile computing world. Tech Support: 6 Tips for Online Board Engagement – page 32 By Jeanne Allen, Duke University Nonprofit Management Program and Jeanne Allen Consulting Social Media and other tech tools are embedded in the communications and fundraising strategies in many nonproﬁts. Yet, it is still a ﬂedgling in the boardroom. Encouraging board members to use social media and other online platforms as part of their duties can set the tone for a culture of engagement, the magic that can be missing from many boards. This article examines six common responsibilities of boards, and how social media and other tools can be used to engage both your board and your constituents. Making Green Events the Norm Interview with Julie Tonroy, International Living Future Institute – page 34 Prepared by Eileigh Doineau, NTEN Can your organization’s events be environmentally sustainable? The International Living Future Institute’s Conferences and Events Manager, Julie Tonroy, shows NTEN the ropes on creating zero waste events, and shares her greatest obstacle to achieving a truly green event. Editorial Committee Proﬁle: Jeanne Allen page 36 Jeanne Allen, Instructor at Duke University Nonproﬁt Management Program and Consultant, answers six questions about nonproﬁt technology. GET THE TIPS, TOOLS, AND INSPIRATION TO MEET YOUR NEW YEARS RESOLUTION. 1 CompassPoint. (2011). Daring to Lead: A National Study of Nonprofit Leadership. Bell, Jeanne; Cornelius, Marla; Moyers, Rick. Retrieved from http://www.compasspoint.org/. MY REVIEW OF RECENT CEO/ED JOB ANNOUNCEMENTS FROM NONPROFIT ORGANIZATIONS FOUND THAT 70% OF POSITION ANNOUNCEMENTS MENTIONED TECH ONLY BRIEFLY AND 48% OF ANNOUNCEMENTS DIDN’T MENTION TECH AT ALL. ways that they’ve used technology successfully in the past, or lets them share their vision for your nonproﬁt. 5. Don’t Get Lost in the Details: When you’re hiring your top executive, an understanding of the importance of technology and a willingness to learn is much more important than experience with any speciﬁc program or application. If you’re a MailChimp shop and your top candidate is a Constant Contact whiz, you’re going to be ﬁne. But if you ask about databases and they talk about rolodexes, you might want to revisit your resume pile. 6. Knowing (What you Don’t Know) is Half the Battle: It’s ok for your next ED to have some knowledge gaps in their tech repertoire. But hiring someone who understands where their own knowledge ends and how to staﬀ up or otherwise secure resources to keep the organization technologically strong means your tech needs will be well cared for. Miriam Barnard (miriambarnard.com) provides organizational development, consulting, and transition support for nonproﬁt organizations in Oregon and across the country. She has over a decade of management, fundraising, and planning experience. As an associate with the Nonproﬁt Association of Oregon’s Executive Transition Services, Miriam works as an Interim Executive Director for Oregon nonproﬁts, and also provides nonproﬁt Executive Search services. Miriam lives in Portland, Oregon, and is on the NTEN Board of Directors. About the Research: To learn more about the research that helped to inform the article, please contact editor@nten.org. You’ve been part of the online security sector since the early days in the 90s. How has the sector evolved? Early computer security looked a lot like physical security: put all your valuable assets in one place, and build a fortress around it for protection. IT departments took care of centralized ﬂeets of desktops and servers. Firewalls delineated an explicit perimeter, and a person was either 100% fully trusted or 100% fully untrusted depending upon which side of the ﬁrewall they were on. All things of value stayed inside the ﬁrewall perimeter. Eventually network DMZs (demilitarized zones) became status quo as an intermediary layer to publicly expose limited computing services to un-trusted or semi-trusted parties on the Internet. Fast-forward to today, we see operational notions like cloud computing, SaaS (Software as a Service), and mobility have fundamentally decentralized our fortress and scattered our digital assets all over. No longer can we point at a clear perimeter to defend. The blossoming of mobile computing means work is now done from anywhere a person may be located. You no longer backhaul the people to the data, instead you bring the data to the people. This is very powerful for productivity, but operates contrary to the “centralize and fortify” security philosophy. But it is not just about keeping (outbound) distributed organizational data secure – the way people interact with computing services has fundamentally changed due to mobility. Mobile applications bring new compelling ways to engage with people, including the (inbound) data they oﬀer. Whether it’s sales transaction information, donor information, or other PII data, your organization may now be party to the responsibility of keeping that data secure at the point of entry, i.e. on the mobile device. No longer is it just a stateless web browser operating on a backend service; real computing is happening localized to the user through mobile applications, and with that comes the implications of data security and user trust of oﬀering a safe computing experience. at all. Thus organizations need to stop thinking in terms of device-level security since it’s often out of their control, and instead turn their attention to what actually matters: the data. Oﬀering a mobile application that facilitates the collection of data necessitates the need to ensure the mobile application is following security best practices such as keeping that data secure while at rest on the device, securely transmitting it over the network only to authorized parties, and proactively identifying when security is being actively impacted by an attacker or malware. embracing BYOD and BYOA is increased productivity and reduced overhead. Allowing employees to use their own devices and applications for work and personal use enables employees to be more productive on the go. Eliminating device management from the mobile security equation also saves organizations a great deal of time and money. BYOD and BYOA do, however, raise serious concerns about the security of corporate and/or sensitive data. The common response to this concern has been to increase restrictions and lock down employee-owned mobile devices. However, Ovum found in their 2013 multi-market bringyour-own-anything survey, that nearly 70%of employees use their tablets or phones to access corporate data, 15.4% of them are doing so without IT’s knowledge, and nearly 21% in spite of established policy. This goes to show that no matter how strict security controls may be at any given organization, data may still be leaking without us ever knowing. enterprise to the smallest startup and everything in between. Mobile has provided employees the ability to choose their own devices and applications, and control how they use them. As a result, mobile has fundamentally changed the way that organizations manage risk. Organizations that take a holistic view of mobile risk and take user needs and concerns into consideration have the most successful mobile security programs. In the past year we’ve seen more reports about incidents of mobile data breach. According to the, “Impact of Mobile Devices on Information Security: A Survey of IT Professionals,” 79% of companies reported a mobile data breach, with the cost of data loss ranging from less than $10K to over $500K per incident. It’s no wonder organizations have moved from managing devices to the real issue, protecting the data. So in today’s fast paced mobile environment, how do organizations manage the risk of mobile data loss while supporting productivity? By utilizing next generation mobile technologies to fortify applications, organizations can trust the applications their employees are using are secure and that data won’t be lost in the name of productivity. Organizations that do this will be most successful. understand what applications employees are using and what risks those applications pose to your organization. Applications like Trustable by Bluebox can help organization identify risk and take the necessary steps to mitigate it. This app will not only help organizations identify their own risk, it will also help individual users identify risks to their personal data. Another step to take is to understand what external risks your organization faces. The OWASP’s top 10 mobile risks is a great place to start and covers everything from data encryption to preventing man-in-themiddle attacks to client side injection. is a point-in-time statement. Device security comes and goes, depending on the state of known vulnerabilities in the ecosystem and whether your device has been updated to protect against these vulnerabilities. What this means in terms of practical risk management is that any device will go through periods of temporary insecurity until the problems get ﬁxed. This is where the concept of mobile trust comes in. Most users trust that their device will, in the long term, serve their security interests and keep their data safe overall despite the fact that the device may have temporary moments of insecurity and vulnerability. Thus “trust” is a holistic view of the whole life of the device and incorporates notions on whether the vendor is known to proactively issue device updates or patches in a timely fashion, and whether the vendor is making good long-term security choices, etc. Bluebox Labs has recently released a free application, Trustable by Bluebox (see image above), that analyzes all Android devices (phones and tablets) and provides a security trust score illustrating how trustable the device is for security and protection of data. No longer do we need to guess, hope, and speculate which devices may be more “trustable” than others – we can measure and compare on equal grounds. This allows everyone to move away from devices that are notorious for making below-average security decisions, and instead favor vendors/devices that make aboveaverage security decisions. Jeﬀ Forristal has been a security technology professional in the industry for 15 years. His professional background includes all things security, spanning across software, hardware, operations/IT, and physical access control. He has written multiple articles for Network Computing and Secure Enterprise magazines, and is a contributing author to multiple books. GENEROSITY, THE SUBSCRIPTION ECONOMY, AND THE FUTURE OF NONPROFIT FUNDRAISING BY JAMIE MCDONALD, CHIEF GIVING OFFICER, NETWORK FOR GOOD Inspire them once, get them giving forever The most important supporters of any nonproﬁt are the committed donors who give each year. Today, most repeat donors are acquired through an expensive process of online and oﬄine stewardship, involving periodic communications and cultivation followed by an annual ask. And every year, 40-50% of these past donors fall away. Technology is enabling nonproﬁts to reverse this dynamic with subscription giving. To receive multiple one-time donations from a single donor, a nonproﬁt must present a persuasive reason to give every time, which may or may not work. But with subscription—or recurring—donors, you only have to inspire them to donate once. After that, they must actively take steps to stop being generous—which goes against our basic instincts. This results in the long-term retention of subscription givers who will end up giving more over their lifetime than they would as one-oﬀ donors. organization: “For less than a cup of coﬀee, you can provide food for a hungry child.” The image below shows an example from UNICEF. Make sure your online giving page mirrors the campaign message. When a supporter is ready to make a gift, the online giving page should reinforce the campaign messaging and have suggested amounts that demonstrate the impact their gift could have. Recognize subscription givers as special. All points of contact with subscription givers should acknowledge them as a special group that powers and sustains the organization. Identify them as members of a cohort, with a unique identity or brand. Here are a few examples of branded recurring giving groups: • The 1000 Women Campaign of the Women’s Fund of Central Ohio • Pipeline of Charity: Water • Humane Heroes of the National Humane Society • Red Cross Champions Talk about impact. When recurring givers are thanked for their monthly donation, reinforce the impact of their contribution and keep feeding their “helper’s high.” Share stories and images of those aﬀected by their donations. Put a face on their investment in the organization. A strong recurring giving program takes planning. Whether your staﬀ is large or small, here's a checklist to get you started: Build the organization’s commitment to launch the program. Create a name and brand for your monthly giving program. Test and measure. Try several campaign themes with segments of your donor base to determine which campaign motivates the most donors. Fundraising “ask” examples (from top): UNICEF explains the impact of donations, no matter how small; ASPCA’s branded image to ask for monthly gifts. special status as a sustainer of the organization. Communicate with monthly givers about the impact of their gift when each monthly payment is received. Make a plan to handle credit card decline notiﬁcations. Celebrate your growing base of supporters! About the research: To learn more about the research that informed this article, please contact Elizabeth Ragland, Content and Nonproﬁt Marketing Associate at Network for Good elizabeth.ragland@networkforgood.org. Jamie McDonald is the Chief Giving Oﬃcer of Network for Good, the nation’s largest online charitable giving platform. Jamie’s professional mission is to spur people to give, act and innovate on behalf of communities and causes. She writes and speaks about online engagement and giving, next generation philanthropy, and the rise of the millennial generation as a force for changing communities. Jamie serves as an advisor to nonproﬁts, cities, and state associations around the country on giving movements like #GivingTuesday. box.” I reached for my wallet and pulled out a $20 bill, handed it to her, and said “I’ll take 5 boxes!” With a surprised look, she asked “Really?” I said “Yes, however I don’t eat cookies, so what I would like for you to do is to take each box and give them to 5 diﬀerent people you’ve never met before.” Kendall immediately leaped out of her chair and ran to her mom to share her excitement,” Mom, we get to give cookies away!” The transformation in her was amazing. As her excitement settled down, I said “So Kendall, here is why I want you to give the cookies away. I want you to know what it’s like to generously give, to see the joy in people’s eye, to feel their genuine appreciation, and to hear that you have made a diﬀerence for them. I want you do this ﬁve times so that you truly know the joys of giving. experience the journey where they are the hero and are transformed to a better version of themselves in the process. We are the facilitators and a conduit for them to experience that joy of giving. It’s really about how we can become stewards of philanthropy. To facilitate these positive giving experiences, below are some ideas: • Stories of the impact they have made • Genuine personal appreciation • Valuable insights and information for them to share • A fun memorable experience • A moment of positive self-esteem and meaningful recognition • A platform and audience for their message and passion • A cherished personal or business relationship Next time you ﬁnd yourself in a position where you are anxious to ask for something, think about how you can help the other person give. I owe much of my perspectives and inspiration for giving to the following thought leaders who share more in-depth insights and valuable strategies in their books. • Donor Centered-Fundraising by Penelope Burk • RelationShift by Michael Bassoﬀ & Steve Chandlers • Giving 2.0 by Laura ArrillagaAndreessen • The Go-Giver by Bob Burg & John David Mann Yasmin Nguyen is a speaker, philanthropist, social innovator, and storytelling strategist helping business, and nonproﬁts emotionally connect with their audiences through stories, videos, and marketing partnerships to generate sales and raise money. He is the founder of Vibrance Global and Philanthropy Talk, and brings business, community and nonproﬁt leaders together to share ideas, insights, and feedback. With over 18 years in entrepreneurship, communications strategy, online marketing, media production, and relationship building, Yasmin’s mission is to facilitate more giving in our lives, community, and world. Follow him on Twitter at @vibranceglobal. Given the critical backlash to the recent ALS Ice Bucket Challenge, we wondered how nonprofits handle the scrutiny that comes from extensive visibility in social media. To find out, we talked with four nonprofit professionals: Jereme Bivins, Digital Media Manager at The Rockefeller Foundation; Mike Morey, Senior Vice President of the public affairs firm, SKDKnickerbocker; Amber Washington, Manager of Social Media for PolicyLink, a research and action institute; and Brooke Wiseman, CEO of Blessings in a Backpack. manage social media so that it showcases the values of your organization. Plan with the big picture in mind and be prepared to offer useful facts and stories that focus on your mission. Amber: Avoid the back and forth. Often, people will not be satisfied with the response they get. You’ve failed to meet their expectations, reasonable or not, and there’s no way you are going to be able to, so there is no point in engaging in a social media battle. Do you use different techniques for different platforms? Mike: Yes. On Facebook, you should respond as you would to any other type of customer service issue. Things hang around on a Facebook page. On Twitter, which lends itself to snarky comments, you can often just let things pass. Amber: The PolicyLink audience on Twitter is dynamic so comments move through the stream rapidly. Many of the tweets don’t require a response. Facebook pages are different. The info on them stays up for quite a while. You have to consider the source of each complaint or problem and give priority to the ones that have the greatest reach. plan in place, but internal communication is always critical. How do you prepare for managing negative content? Jereme: Think about different scenarios when releasing content or press releases. Consider those things that some people want to tear apart. What’s useful or worth celebrating? What’s controversial or could be misunderstood? What are the valid counterpoints and who might challenge us on it? Be prepared to back up your organization’s point of view without becoming confrontational. Not everyone has to agree with you, but you always want to keep the dialogue civil and respectful. Brooke: Don’t jump to respond to every untruth. You don’t always have to answer a challenge, but you do need to have the clarity to know who you are and what really matters. Then, you can engage thoughtfully. Amber: When I note criticism, I will respond in a neutral way to indicate that we acknowledge the person but don’t necessarily agree or endorse their viewpoint. I am always respectful and do appreciate their interest in our organization. Any other tips? Jereme: Be prepared! Hope for the best, but always be ready for the worst. Use social media as a platform to build relationships with people that understand and support what you do. They can be powerful advocates for your organization and can even engage with naysayers without you having to step into the fray – saving you time and face. Mercantile Exchange), with all of us pitching in to do anything and everything! That experience showed us the importance of facilitating people’s engagement with us over social media. Now we try to offer different options and techniques that makes it easier for people to volunteer, donate to a particular school, or designate their gift for a specific purpose. Bottom line: Be thoughtful. Be prepared. And, above all, just keep moving forward. A member of the NTEN: Change Editorial Committee, Bonnie McEwan is a consultant, college professor and writer. She is profiled in the book, “Thriving in 24/7: Six Strategies for Taming the New World of Work,” by Sally Helgesen, and author of “501(c)(3) Nonprofits and EarnedIncome Generation” in the textbook, “Social Entrepreneurship,” edited by Thomas Lyons. Earlier in her career Bonnie directed the national communications divisions of Girl Scouts USA and the Planned Parenthood Federation. Find her on Google+ and Twitter. healthy nonprofit organizations including: governance, staffing, planning, programs, finances, fundraising, evaluation, and inclusiveness. 76% to 100% of our grantees have gained tremendous efficiencies in fundraising applications through technology. The winner of the 2014 Annual Report Cover Shot Photo Contest, one of the many fun ways that The Denver Foundation engaged with their community through social media. Tell us about yourself. I have been with the Foundation for nine years and came here after having served as Executive Director of the Northern Colorado AIDS Project. I currently have the tremendous pleasure to serve as the Vice President of the Mi Casa Resource Center Board of Directors, advancing economic success of Latino families in Denver, Colorado. For eight years, I have taught courses in “Wealth and Philanthropy” and “Resource Development” in the Masters of Nonprofit Management Program at Regis University. believe aligns with the incredible savvy and generosity of our Denver nonprofit and donor communities. On the grantee side, we have had an online application available for our resident grantmaking program for some time, and we are currently working to create both an online grantmaking system for all discretionary grants and an online scholarship application system. How has technology been used to demonstrate the impact of the organization and how has this contributed to increased funding? In addition to the exciting potential benefits of the Floodlight tool, the Foundation offers other avenues to demonstrate impact. We highlight stories of our grantees through “Good News” eblasts, online newsletters, “Give Magazine,” and annual reports. Anecdotally, we see an increased call volume from donors inquiring after complex community problems and exceptional nonprofits are emphasized. including web-based grant recommendations. These tools have particularly come in handy when natural disasters (such as wildfires) have threatened our region and we have stewarded funds to take action, or when families create memorial funds. However, the reality is that the vast majority of our donor demographic aligns with the Boomer and Veteran generations. Consistent with our peers we have catered our communications to these demographics. However, this year we have taken a deep dive into the changing preferences of Millennial giving (personal connections, global view/local action, time, talent, and dollars) by offering specialized, targeted issue briefings and opportunities through relationships reinforced by social media outlets. What else would you like to add? Though donors and their families are dispersing more globally, we know that people have an increasing hunger for local connection. It is critical to strengthen the tether of donorcentric information as it intersects with emerging needs in our local communities. While tools such as Floodlight and social media platforms will be a prominent cornerstone in our efforts, The Denver Foundation will need to double down on innovative techniques such as the ones mentioned here and many more yet to be discovered. Christiano Sosa is the Director of Capacity Building at The Denver Foundation. He previously served as a Program Officer for the Gill Foundation and The Denver Foundation. Christiano is a Colorado Trust Fellow and for the last eight years, he has taught courses in “Wealth and Philanthropy” and “Resource Development” in the Masters of Nonprofit Management Program at Regis University. He currently serves as the Vice Chair of Mi Casa Resource Center Board of Directors, advancing successes of Latino families in Denver. Tell us about yourself and what you do? I am Rahsaan Harris, the Emerging Practitioners in Philanthropy (EPIP), what we do is provide leadership development for changemakers that are committed to changing organized philanthropy to make the world a more just, equitable, and sustainable place through their grantmaking in how they move resources. We’re also committed to making sure that changemakers, no matter where they go, share the same values to make the kind of world that we want to make. measure a leader.” Measure a leader is about helping our members develop their leadership skills to help them have more of an impact. We see social media as an important way of connecting our members to one another, aggregating knowledge, and giving them a chance to actually have a platform to share their ideas with the rest of the field. A lot of times, people who are emerging and new to philanthropy don’t necessarily have many platforms to share ideas, and provide thought leadership, but we see social media as a place where they can. What technology and strategies are you using to promote these new ideas? In particular, the technology that we try to use is Twitter, Facebook, we’re also looking at a new platform called NationBuilder that was used by a lot of political campaigns to really reach out to people that were like minded to get them to vote. We also use Salesforce for our database, and we use Google Apps for our mail system. What drew you to your current work? I got drawn to my current work because I was working at the Atlantic Philanthropies, a grantmaking foundation that is actually going out of business because they believe in giving while living. While I was there, working as special assistant to the President and also as a program officer, I really was able to build my experience and figure out how to leverage power through networks. EPIP was one of the places that helped me to develop my national network of people who work in foundations across the country. When I left the Atlantic Philanthropies to get my PhD and was looking for a job [after], EPIP was a logical place for me to work. about relationship building, so we’re really trying to get better at articulating what our vision is, what our mission is, who we are, and why we’re valuable so people want to invest in us. Are you using technology in fundraising and if so, what tools seem to be the most effective? In regards to technology, technology can be really important to fundraising because it helps to maintain relationships and keep people up to date. So doing things like reaching out to people periodically with email, social media, creating videos, allows us to connect with our potential funders and help them see what we’re doing on a regular basis. Is there anything that we didn’t ask that you’d like to share? Anybody can use technology and social media. It’s not difficult, but it takes risk taking and determination that allows someone to unleash its power. You don’t lose much by taking risks and innovating in ways that are not necessarily very cost intensive, so I really encourage people to step out there, get feedback, and see what works because that’s when success comes and that’s how innovation happens. This interview was transcribed from the video recording created by Rahsaan Harris. To view this video, please visit: youtu.be/IhvbPWHCveE. Rahsaan Harris, Ph.D. has over 15 years of experience working in philanthropy and nonprofits. His experience also includes teaching high school and serving as a volunteer in the Peace Corps. Dr. Harris’ expertise is in organizational assessment, diversity and teaching. He is the executive director of EPIP, Avery’s dad, and a Spanish speaker. CALL FOR NONPROFITS Participate in M+R and NTEN’s 2015 Benchmarks Study to help determine this year’s industry standards for online fundraising, advocacy, and list building. Now in its ninth year, the study collects data from 50+ organizations to capture the metrics and trends that nonprofits can use to gauge their current work, and help inform how to move forward with their digital strategies. If you’d like to participate, fill out this quick survey: mrbenchmarks.com /participate.html. Screenshot of NGO Aid Map's project list in Haiti, where this initiative began. Check it out: haiti.ngoaidmap.org. Gathering up-to-date, standardized data from over 100 NGOs is no small feat. Getting here has required us to continuously focus on two things: understanding our members’ motivations for sharing data, and ensuring the quality of the data on the site so it is trusted and used. Building political buy-in was the very first step. From the beginning, we’ve made it a point to work closely with our members, who we’ve consulted on everything from data standards to the functionality of the tool. We knew from previous experience that just demanding information wouldn’t work; members had to feel comfortable if we were going to get data with the level of detail we were asking for. We had to build their trust and help them understand the risks and benefits for sharing information. They needed to know that the time and effort spent providing this data was worthwhile. We’ve learned that most NGOs are willing to share data for three main reasons: 1) To raise the visibility of their work, both as individual organizations and as part of the larger NGO community 2) To demonstrate their commitment to transparency 3) To save time, by giving organizations a resource to which they can direct their key constituents and donors. In addition to understanding motivations, we also spend a lot of time thinking about what we can do to improve the site’s data Images on right: Screenshots from the NGO Aid Map site. To learn more, visit NGOAidMap.org. Analytics, we know that people from countries all over the world are visiting the site, and in November alone, we received more than 10,000 visits. From surveys, we also know a little bit about who those people are: most are from NGOs, followed by universities or think tanks, the private sector, and donor agencies. User feedback suggests that NGO Aid Map is a powerful tool and “discussion starter,” helping NGOs and their funders demystify the complex web of international aid. Provide up-to-date detailed proje ct d including donor information, budg et and more. These anecdotes have proved invaluable as we look for ways to improve NGO Aid Map as a tool for organizations to do more and do better work in the field. 5 CORE PRINCIPLES OF NGO AID MAP 1. Make it as easy as possible to share data. If it’s not easy, organizations won’t keep providing information, and there is little value to a map that never gets updated. 2.Present the data in a way that makes it simple to understand and use. NGO Aid Map is designed to make it easy to ﬁnd the information people are looking for, to help them make the decisions they need to make. 3. Make the data open and accessible. We know there are many ways to slice and dice data. That’s why we’ve made it possible to download the data on every page of the site. 4. Do no harm. While we are strong advocates of openness, we realize there can be negative consequences to sharing data. We let organizations know that they should only share information if it is safe to do so, and review data that has been submitted to make sure that there isn’t anything that could put someone in harm’s way. 5.Collaborate with like-minded organizations also working to make more information available. NGO Aid Map is just one piece of the puzzle. By working with organizations who also see the value in open data, we hope to create a more complete picture of what is happening with international aid. We still have a long way to go before we have information on all of our members’ projects. And we realize that, even if we did have this, information alone is not enough to make development better, but it is a necessary step for long-term success. The NGO community is stronger when it works together. By working with NGOs to help them collectively harness the benefits of new mapping and other data visualization technologies, we can help build the tools today that will help address the humanitarian emergencies and aid efforts of tomorrow. Others have reported using NGO Aid Map to inform proposals, to share information about their work with governments and funders, or to find out who might be responding to a disaster or supporting certain groups (such as people living with disabilities). Julie Montgomery is the director of innovation and learning and leads InterAction’s mapping efforts. Laia Griñó is a senior manager for transparency, accountability and results and leads InterAction’s transparency work. Embed maps on your website, add pictures and videos to projects, and use the map to promote your work via social media. Direct your constituencies and dono rs to a one-stop shop for project data. Use the map to connect and coord inate with local civil society and potential intern ational partners and donors. Screenshots from CCNY’s publications on MAZ. world where everyone online is competing for attention, keeping readers satisfied is crucial to keeping them engaged. As Carnegie Corporation of New York’s Director of Digital Strategies, James Murdock oversees the development of online tools to disseminate the work of the foundation and its grantees. He has also served as Director of Multimedia Content for The New York Public Library, where he designed mobile and video products, such as the iPad app Biblion, to publicize special collections. Tech Support: 6 Tips for Online Board Engagement ByJeanne Allen, Jeanne Allen Consulting, Instructor/ Manager, Duke University Nonprofit Management Program, Editorial Board, NTEN: Change Journal Social media and other tech tools are embedded in the communications and fundraising strategies of many nonprofits. Yet it is still a fledgling in the boardroom. Encouraging board members to use social media and other online platforms as part of their duties can set the tone for a culture of engagement, the magic that can be missing from many boards. Providing opportunities for a board to practice, or to learn new skills, can help make a board a magnet for the “creatives” and the innovative thinkers. This article examines six common responsibilities of boards, and how social media and other tools can be used to engage both your board and your constituents. be shared. Find 1-2 board members who are familiar with this or willing to be your early adopters, and get them to take the lead. This allows board members a chance to experiment, to learn a new skill, or to play a lead role in moving the board forward. Attend all board meetings & functions, such as special events: While at the meeting or event, have a “selfie” moment: Ask all board members to take a picture and tag it/post it to the organizational Facebook or Instagram account. Brainstorm fun or provocative comments to post about the meeting or the eventand do it live in the board meeting. If location is important to your events (ex. museums, animal shelters) use a geosocial platform, such as FourSquare, and have board members check-in. This can create a sense of belongingness, and a culture of sharing." been an audio link at one point. On the last slide, there is a link to SurveyMonkey. Board members could be asked to list their 3 questions, 3 concerns, and more, which are then compiled for the meeting. “Providing opportunities for a board to practice, or to learn new skills, can help make a board a magnet for the “creatives” and the innovative thinkers.” members may be active on Pinterest and ready to share stories for the public. Search “nonprofit boards” for pages with links to additional information. Example: Make-A-Wish Foundation, Phoenix AZ Create a “board” on your nonprofit’s Pinterest page that is specific to your Board and your Board Development plan. • Consider hosting a Tweet chat during your Board meeting. Announce to your members or constituents what the topic will be. Ask for their input into the strategic plan or trends that are impacting your mission. For first time success, make sure that some members from outside the boardroom will join the conversation. Have all the board members participate together so that they can learn together. Limit the duration to a short period of time, at first, perhaps only 30 minutes during the meeting. Project the tweets so that all can see. Make sure that all involved know that this is a first time experiment to set a tone of learning. profiles with their affiliation with your nonprofit. They could also post updates about their involvement, or new directions, not just ask for money via these networks. Posting your organization’s name helps with board recruitment, as potential board members might like to know more about the board membership prior to joining. Example: LinkedIn Board Connect tells how to use LinkedIn for board recruitment. Go to the site and click on "find board members.” Want a more engaged board? Lead a brainstorming session with the board on how to use social media to meet the ongoing responsibilities of the board. Have board members select one or two ideas to begin. Try, fail, experiment, and learn what works in your nonprofit. Have fun with social media and various platforms. Engage your board in creating a new culture of learning. Jeanne Allen focuses her work in the intersection of board governance, technology and nonprofit strategy. Her work includes Instructor/Manager in the Duke University Nonprofit Management Certificate Program (NC) and leading her consultant practice with nonprofits (Jeanne Allen Consulting). Jeanne is a BoardSource Certified Governance Trainer and a newswire contributor for Nonprofit Quarterly. Green events in action (clockwise from left): Using reusable native potted plants for stage dressing, Maya Lin delivers keynote address at LF14; ILFI connects their attendees with local Portland food trucks for lunch, and uses sustainable GoBox lunch ware; Attendees explore green rooﬁng materials at LF2014. “INSTEAD OF DWELLING ON THE NEGATIVES, WE ASK ‘WHY WOULDN’T WE WANT TO CREATE BUILDINGS AND COMMUNITIES THAT ARE BEAUTIFUL, HIGHLY EFFICIENT, AND NONTOXIC?’” minimize the impact of attendee travel, but we are in a more challenging position with regard to food sourcing. The average plate of food in America travels 1,500 miles and is primarily sourced from industrial agricultural models because of the exclusive relationships at venues. Many purveyors do not necessarily consider regional, seasonal, sustainable food options as the preferred model. It takes eﬀort and resources to put sustainable food on the event tables. Events by their very nature are fraught with environmental challenges, and I hope that events managers heed the call for sustainable events. It’s when the conversation shifts from an irregular position to a standard request that food and procurement will change, the cleaning agents will change, and that we will all see healthier, sustainable plans in place wherever we go with our events. JULIE TONROY is the Conferences and Events Manager at the International Living Future Institute, the creators of the Living Building Challenge, the world’s most rigorous building standard. She produces events for more than 2,500 people a year that promote a socially just, culturally rich, ecologically restorative future. She holds a B.A. in urban studies and planning from San Francisco State University. every person involved in the nonproﬁt sector is impacted by technology changes – and that deserves bigpicture thinking. What was your ‘ah-ha’ moment? NTEN partnered with NPower in Charlotte, North Carolina for a workshop on “Becoming a Datadriven Organization” in June 2011. More than 150 nonproﬁt folks stuﬀed the room. The day overﬂowed with amazing examples and stories of nonproﬁts moving into using technology, and tools, and giving meaning to all the accumulating data. A group of colleagues drove from Durham, a couple of hours away. We talked all the way home about the implications and how we could use the information. How has nonproﬁt leadership changed as a result of technology, from your perspective? Technology is deﬁnitely more integrated into organizational culture, not just the database for capturing names. Increasingly, I hear conversations about measuring impact as it relates to social media eﬀorts. Also, technology has made managing nonproﬁts a much more complex challenge, with more tools and more possibilities. Why are you serving on the NTEN Change Editorial Committee – what makes you want to volunteer? 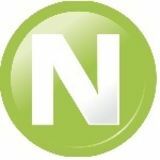 When I became a member of NTEN, I looked for ways to get more involved and to increase my connections to this community. I love talking to nonproﬁt folks and uncovering their stories and examples that can be shared in the journal. Whenever I hear someone describing a project that they’re doing, or sharing what they just learned about technology in their nonproﬁt, I ask them if they’d like to contribute to the next journal. It’s great fun to give people a chance to share their stories about their nonproﬁt. What’s the one technology tool that you wouldn’t want to go without in your daily work? On a daily basis, I use my trusty laptop and smartphone. I remain amazed at the technology that is available to me via my smartphone. It will be so fun to see what evolves next as the generations who are growing up with smartphones push the limits and create new possibilities. We need to strategically think not just about the technology itself, but also about how these changes will impact work flow, relationships, outcomes, and the nature of the problems that we seek to impact.